The history of development of exterior fenced structures is a striking example of obligatory following of traditions, which were formed in the science of structural engineering. The basis of thermal physics of fenced structures was developed intuitively through metaphysical analyses and numerical methods of molecular thermodynamics. But their constructive-technological character didn’t change in principle for centuries. 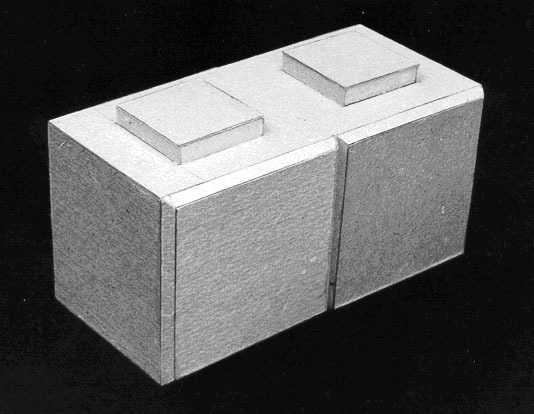 The concrete masonry units (thereafter CMU) discussed in this article with air-closed and purposely shaped inner space and specified density of concrete mix design differ from known types by novelty of thermal-physical design. Application of air-layers into exterior walls has been known from about fourteenth century in Arab countries, were they used it for cooling of heat in premises moved by convection through channels from basement part of building into wall spaces. At present, the inner channels or technological voids are used for draining and drying of wall materials “by thermally heterogeneous spaces” into body of wall with the purpose of improving the walls' durability. But despite of all the variety of technical solutions and wall designs, they all could be characterized by general criteria such as that the surface of air-closed space should be dense to prevent scattering of thermodiffusional flows and absorption of radiant part of heat energy. Background for the optimization model. Light- weight concrete is the most developed in the modern wall building industry. Dominating volume of big pores and enough strength make light-weight concrete widely used in southern countries. These walls are light and have good thermoresistance, but still need to be water protected and maintainance is expensive to keep required durability. Another type of wall structure is a heavy weight concrete panel or blocks with light-weight isolator inside. These walls are more popular in northern territories as they proyecy from water and freezing. The heavy weight of these walls requires enforced foundations and building frame. The concrete part is durable enough, but the isolator inside is stable only for 10 to 15 years. 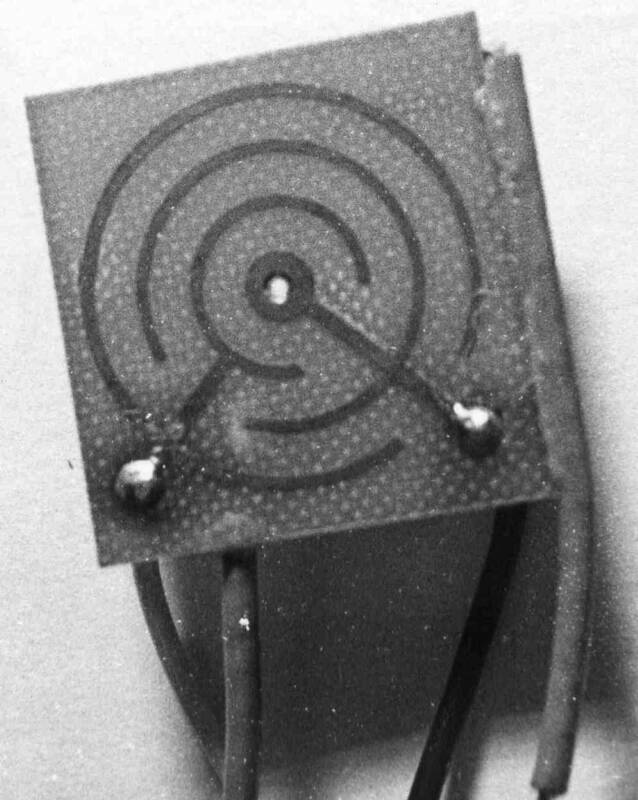 In both cases, the principle of air-heat resistance is used. As shown below, the best results for thermoresistance, waterproofing and durability could be achieved by a combination of heavy weight concrete durability with the high thermoresistance of light weight concrete. The concrete body is divided into two parts: the solid scope of concrete, i.e. the gel-crystalline-filler-cement part, and second part is the summary volume of the capillary-porous system of that concrete body. Therefore, our goal was to get highly dense concrete with isolated voids inside. Actually, this is like a big model of an air-closed pore in concrete. The main goal of optimization of wall model was to find out the best position of air closed layer inside the wall: closer to outside surface of wall; in the center of wall; or closer to inner surface of wall. Using corpuscular-wave ideas about heat flow, let’s analyze the quantum-mechanical picture of heat flow through the body of a concrete wall. Such a dualism is very helpful for thermodynamical description of how heat flow goes through the materials of wall, that is helpful for comparative evaluation of different wall designs and also for the best choice of building materials. Frequency spectrum of heat wave is close to frequency of air. The difference between them is rhe level of energy. Therefore, equalization of these energies goes very fast and provides the highest thermoresistance of wall, i.e. collision of heat wave particles (dust, molecules, atoms, etc.) with particles of air-closed void. An air-closed void in a wall is the best heat isolation. In developing equation (1) some working parameters come to the difference between temperatures Tin – Tex that should be as big as possible to get maximum thermoresistance of wall. Prediction of wall’ thermoresistance and effectiveness of high resistant layers is feasible by equation (2), that provides layer by layer calculation. These calculations were made for the blocks with different shapes of air-closed inner voids. 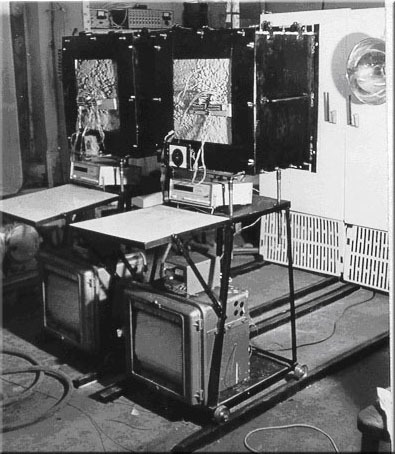 The most effective blocks were taken for experiments. 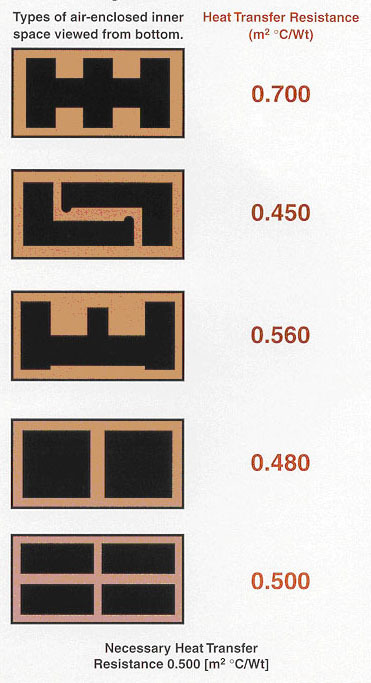 In figure 1 are shown 5 types of blocks, which were tested in a climate camera for comparison of block thermo-resistance. Every block was provided with special indicators shown in figure 2 for comparative evaluation of temperature, relative deformations and moistness on both inside and outside surfaces. For comparison analyses of five models of walls were made with heavy monolithic concrete, light concrete, sandwich-type panel, light concrete with Perlite / Vermiculite containing isolation layer and °BLOCK. They were placed into the window frame for two years to be exposed to winter - 40°C and summer +30°C temperatures. Only one °BLOCK showed excellent thermo-resistance, lowest moistness and minimal thermal deformations, which are crucial factors for the walls durability. Other specimens were frozen through and had very high moistness on their inner surface. These results again confirmed previous studies about the unsatisfactory standard wall design. It was determined that experimental results do not have deviations with calculations, which became an algorithm base for software development. This software allows designing of °BLOCK for any geographical climate conditions. 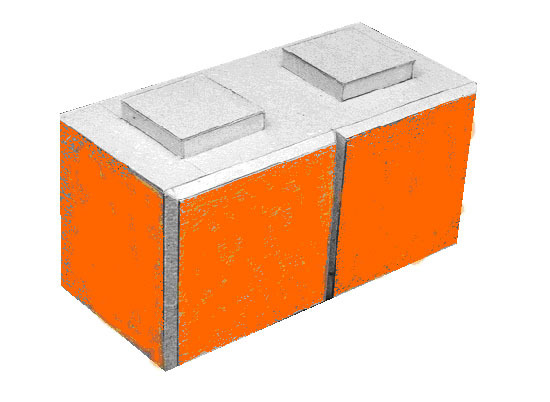 Properly designed °BLOCK provides stable thermo isolation, dry walls and best protection from biological growths. In developing ºBLOCK another modification has been designed for building of underground/ underwater walls capable of protecting enclosed accommodations by impermeable and thermoresistant structure. Some elements are shown below. 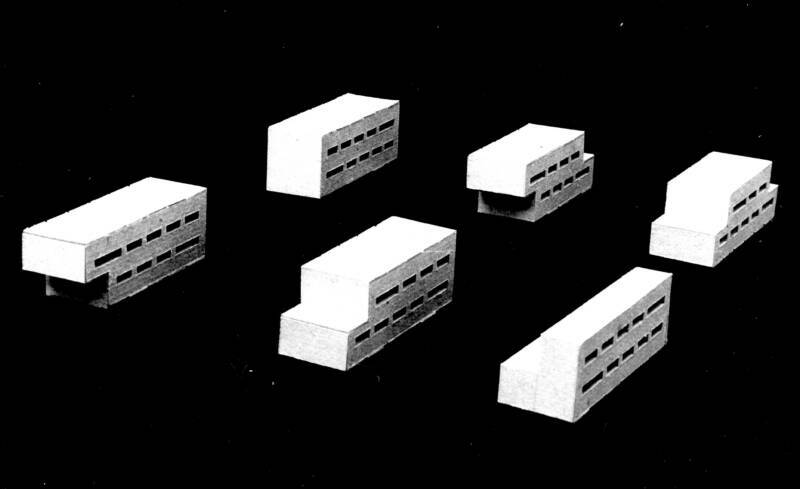 Five models of walls were exposed to outside through the window for two years. Three function indicator for evaluation of changes in temperature, moisture and deformation in the model of wall. Ten of them were installed from outside to inside to monitor changes 24/7.